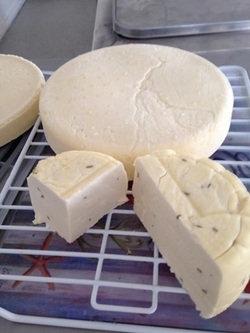 We make fresh, warm, squeaky cheese curd - Plain, Garlic & Chives, Chipotle, Mustard Dill, Onion Pepper and other seasonal flavors. We are now pressing wheels to create aged cheddars and producing "Swedish Bondost" which is a semi-soft farmer's cheese flavored with fennel seeds. 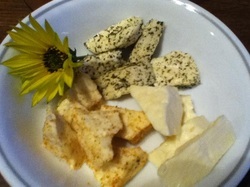 There is also an "Italian" mild cheese with basil and sun-dried tomatoes. We are proud to also offer an old-fashioned, hand-pulled mozzarella ball, named "Bolita". This is a mild cheese that is great for cooking or with cheese and crackers and some pepper jelly! Made upon request with prior notice.